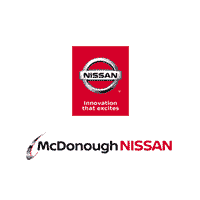 View all that the McDonough Nissan Parts and Service Team has to offer by clicking the button below! Must present when service order is written. Conventional motor oil up to 5 quarts and some models may be higher. One coupon per customer. May not be combined with other offers. Not applicable to prior purchases. Not responsible for typographical or printing errors. Other restrictions may apply. Nissan vehicles only. Expires 4/30/2019. Must present when service order is written. One coupon per customer. On select tires. May not be combined with other offers. Not applicable to prior purchases. Not responsible for typographical or printing errors. Other restrictions may apply. See adviser for details. Expires 4/30/2019. Must present coupon at time of service. Dealer not responsible for typographical or printing errors. Limit one coupon per person and cannot be combined with other discount or prior purchases. Valid on Nissan models. By appointment only. Other restrictions may apply. See service advisor for details. Expires 4/30/2019.